How do I assign an outcome measure(s) to a patient? It is possible to assign patient reported outcome measures (PROMs) to a client in as stand-alone outcome measures or combination with exercises and/or educational content. 1. Directly from the " Library" > " Outcome measures" tab. 2. From the Client file. Scroll through or search for your PROM. Select the PROM(s) you would like to assign by clicking in the selection circle. 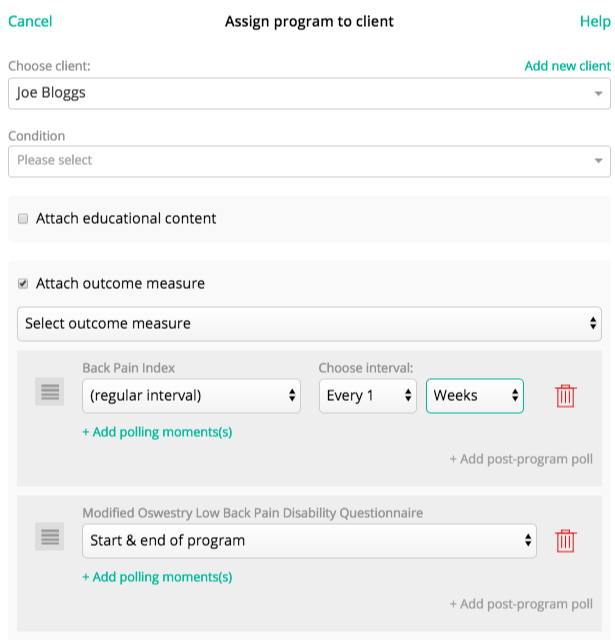 Click on the basket to the top right corner to preview (and edit) the content you will assign to your patient, then select the " Assign" button in the top right corner to make the finishing touches to your program. Lastly, select when you would like your patient to complete each PROM using the drop down functions. Scroll down and select "Assign program" to generate (and send) the access code to your patient. Go to Clients and find your patient. Open their file and click either "Assign new program" (to add a PROM to a new program) or "View program" (to add a PROM to a current program). Follow the steps mentioned above from step 1 to complete the process. Your patient will see the survey(s) the next time he/she logs into PhysiApp, and will see the survey again at the intervals set by you. What do my patients see? Which outcome measures does Physitrack offer? How do I select when the PROM(s) will be completed by my client?